It seems like I'm the only one who has a ground connection running from the drives to the chassis. Don't any of you guys bother about the static buildup on the drive from the constant high speed spinning? There's no need for a separate ground connection AFAIK, after all, the drive is already grounded through the power connection. Out of all the hdd's I've taken apart (I use the platters as coasters ), I've yet to find a connection from the cast to any grounded point on the circuitry, it seems to be totally insulated from the rest of the disc. Maybe there is, but, TBH, I haven't properly looked. I've yet to find a connection from the cast to any grounded point on the circuitry, it seems to be totally insulated from the rest of the disc. Used some elastic rope-like material, like the ones used on the outside of backpacks. It seems sturdy enough. My only concern is about cooling. There are some interesting solution here My solution was to get a P180 with soft rubber mounts. (not a pep out of the drives) I like it. Here'y my solution It's part of my efforts at building dual-Opteron workstations that don't sound like leafblowers. The cases came with two removable drive cages, and they're just the right size so you can suspend a couple of drives vertically. I bolted the two drives together just to make their installation easier, but even with the extra width the drives still hover few millimeters above the bottom of the drive cage. ^ wow, that's a very good idea...I think i'll be doing that for future systems without a free 5 ¼ inch bay. very curious tho as to how your temperatures are impacted bythis setup?? how much have your HD temps increased (or decreased) putting the hd's this clsoe together???? place one end of ur multimeter on one of the screws at the top corners of the drive, the other end on any part of your casing. I don't think I'd trust two drives that close together unless there was some effective cooling for them. In the planning stages I guesstimated that the intake fan would be sufficient, and it seems to have panned out ok.
My HD's are double damped baby!!! Not exactly suspension. This is a Seagate 80GB HDD that vibrates a lot. I didn't hard mount it to the computer since it made so much vibration, that the steel panels would vibrate and resonate and drown out everything else. I resorted to putting onto one of the Antec drive sleds and sitting it on the bottom of the case, occasionally kicking the case to jostle the hard drive around if it go too noisy. 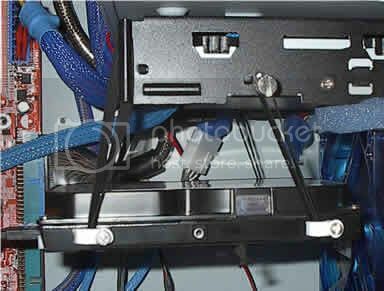 The HDD is mounted into the Antec drive sled, which sits ontop of the clear boxes which they ship hard drives in, and is held using the two red rubber bands. Inside the clear box is full of bubble wrap. The entire setup sits on approximately 3 layers of bubble wrap (approx 2cm thick). And it sits on the bottom of the case (thanks to mATX motherboard, there is plenty of space. 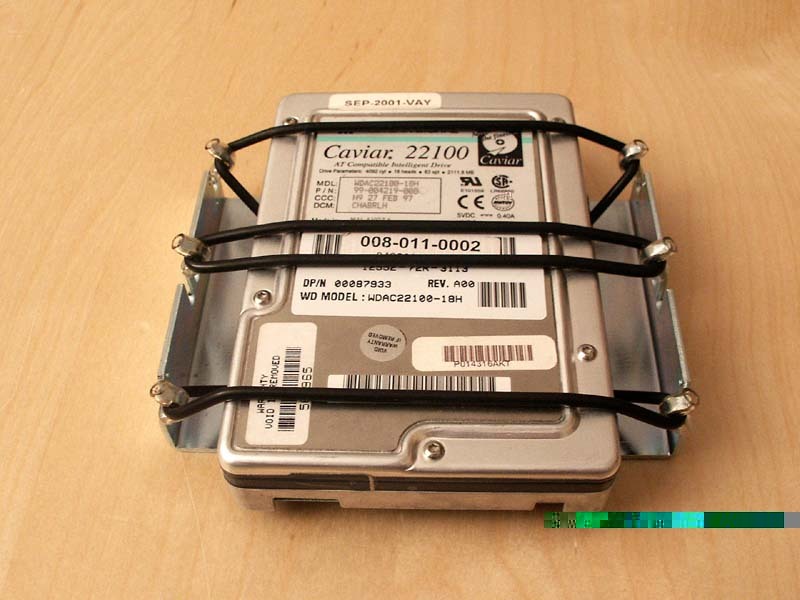 Probably not as good as suspending a hard drive, but it is extremely effective. Virtually all vibration/resonance is gone. Clever. I love ghetto modes that are simple and work. I'll bet this one does. Thanks. I tried putting elastic into the case to suspend, but the holes in the 5.25" bays don't line up, and since I can't mod it, I had to think of something else. Actually, the result using bubblewrap was much better than I expected. You should try it yourself. i've done something similar to that...i used some foam material used for crafts. Worked surprisingly well for my old, noisy IBM DeskStar. 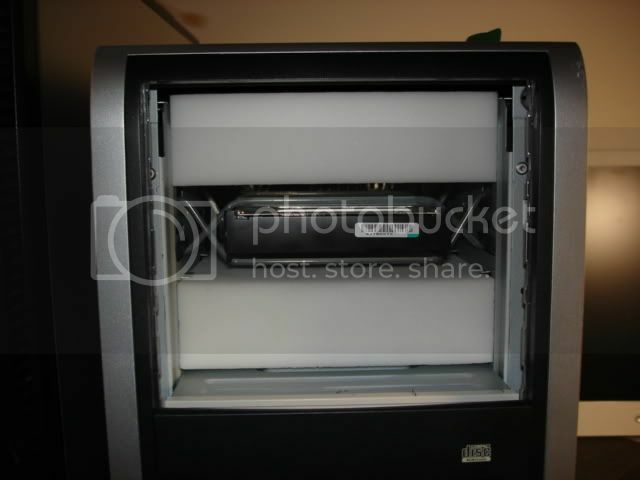 The shortcoming of this settup is the lack of airflow to the bottom of the hard drive. Watch your harddrive temps with SpeedFan or some other temp monitoring software. Change the mounting setup if the HD temp goes too high. Last edited by agus_c_o on Thu Nov 10, 2005 10:13 am, edited 1 time in total. How important is it to check the temps? Before using the bubblewrap, it was just sitting on the floor of the case for around 2 months- no apparent problems. What do you define by high temps? The system is fairly low power, GeForce2 MX, Socket A Sempron2600+. My hard drive (different computer-in my sig) hits about 48-49 degrees regularly, and its still going well. How important is it to check the temps? 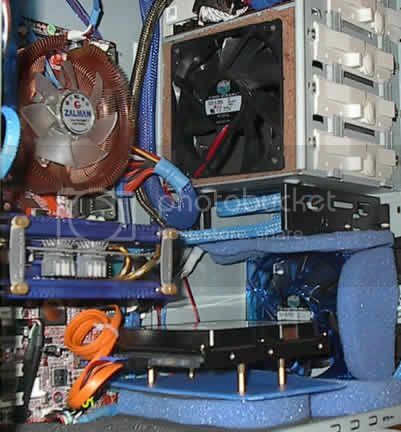 Here's a simple idea for owners of the Antec 3700AMB/3000B case. I don't think I've seen this before, but if someone else has posted this in the past, my apologies! There's a complete writeup on my website. (Note, though, at the time of this writing, the website is still lacking some polish and narration, but the pics are there---watch out though, the pics on the website are huge). My first attempt was using "Stretch Magic", as you can see below in the next two pics. This is a quick and easy method to pull off, but very hard (if not impossible) to get the drive to level. If you look at the pictures, you can see that the drive actually unlevel in across two planes. So here's my current idea: use some kind of stretchy material (I used bungee cord in the following pics) to create two groups of two X's across the cage (the picture makes more sense than my verbage! ). You can see below that the bungee cord holds this drive rigid enough to meet my "perfectly level" requirement. Finally, here's the same idea re-implemented with Stretch Magic. In this case, I definately need some method of protecting the cord from the cage (at least for the bottom holes). This job is pretty sloppy, admittedly, but it was just a proof-of-concept. For what it's worth, I initially ran one length of Stretch Magic to determine how long the other three lengths should be. I came up with 42", which is really to short to tie once you get to the end. If I did this again, I'd probably use 50 or even 60 inches of stretch magic per run. That stuff is just too hard to tie if you don't have a lot of length to work with (and sweaty hands make it even harder). I haven't put this method into production yet. I actually found some side-mounting hard drive heatsinks that I'll use when this goes in the computer. Also, I need to find a better material (probably just go with smaller diameter bungee cord), and most importantly, some kind of protection for the cords themselves (protection from the rough edges of the drive cage that is). 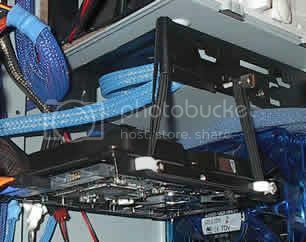 Do those blue EAR grommets make any perceptible difference vs. the stock black rubber ones (in the hard drive cage)? I think silicone should be much safer and more durable than rubber, and i think it looks neater too It shouldnt deteriorate over time either. The foam blocks are Nexus Damptek blocks top and bottom, and one in front wich i took away so you can see the suspension. The suspension metod is not new or innovative in any way, i just havent seen anyone using silicone before, why? Its perfect for this. 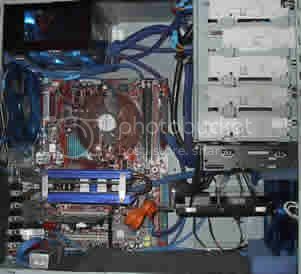 abit KV8 Pro, Athlon 64 2800+, Zalman CNPS7000-Cu fan swap, Kingston 512M, ATI Radeon 9550 @397Mhz [email protected] ZM 80D-HP,Samsung SP0812C JVC FDB suspended, Centurion 5 moded to fit 120mm intake. 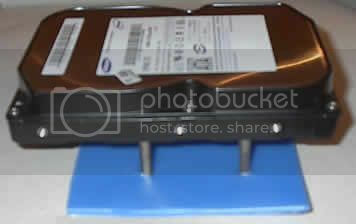 What product do you suggest to cool and dampen two Samsung HDD-s in two 5.25" bay? I heard Zalman HDC is not really worth the money. Thanks agus_c_o for the topic direction! None of the above. They will do nothing for the main source of noise from the Samsung HDDs, which is vibration. The NoVibes3 or similar is the only thing which really makes sense. All the products you mention press too hard against the chassis; the rubber materials they use is not soft or resilent enough to stop all the transmission of vibration. You could do even better by making your own elastic suspension. 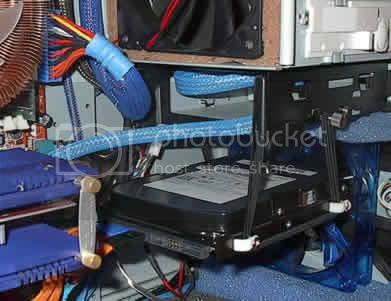 The only issue is that in the optical drive bays, suspended HDDs tends to get a bit hot because there's not much airflow up there. The Nexus Drive-A-Way is definately true to its name, its bye bye to the drive.. Even with a lot of airflow it barely kept a 7200.7 seagate at 50c The Raptor was even worse because the top is covered with plastic and thats were the, very minimal, heat transfer of the drive-a-way occurs. Im thinking about making a birdhouse for one raptor and one spinpoint, with silicone suspension inside, and plastic duct from the house over the graphics card and out thru the empty PCI slots. I just need the wood, 22mm MDF is too thick and thats the only stuff i have atm. Dont want to do the laminate cardboard with fiberglass thing either, or then i just might.. i do have cardboard and fiberglass, hmm.. The NoVibes3 or similar is the only thing which really makes sense. All the products you mention press too hard against the chassis; the rubber materials they use is not soft or resilent enough to stop all the transmission of vibration. You could do even better by making your own elastic suspension. A bad thing, that the later is 3x the price!